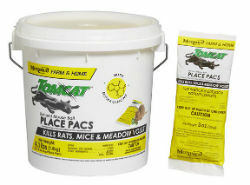 A proven, versatile way to control rats and mice. They provide economical control using the active ingredient Diphacinone, a multiple feed anticoagulant that has delivered proven results for more than 25 years. Ready-to-use Place Pacs are pre-measured with 3 oz. of pelleted bait, and keep bait fresh by protecting the pellets from contamination by odors, dirt, and moisture. Great for putting bait in tight spaces and hard to reach areas. Good for light to moderate infestations. Sold in a pail of 22 Place Pacs.